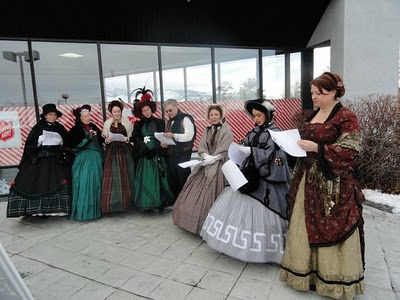 On December 20, 2010, the GBCS went caroling at the Salvation Army Toy Shop. There were 9 of us in costume. It was a cold, but fun time, and rather amusing as us amateurs tried to sing. A great big thanks to Elzabeth and Warren who coordinated the event, and treated us all to Starbucks afterward. Yep, that's right, we invaded the mall to get us some holiday treats. It was fun to see all the stares and to make so many people's days as they took our pictures. Lauren adjusting Dana's corset for her. 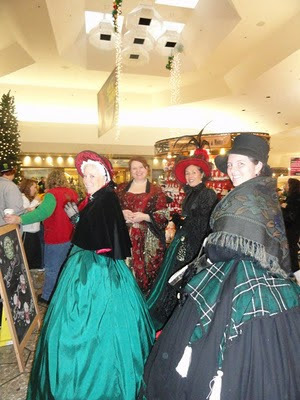 Mary, Carolyn, and Bri staying warm indoors while waiting for the caroling to begin. Sara, getting exited in her "new" outfit (which is really a modern dress with a shawl to disguise it). Warren and Elizabeth, the coordinators for the event and our hosts afterward at Starbucks. Carolyn and the line of shoppers for the Toy Shop. 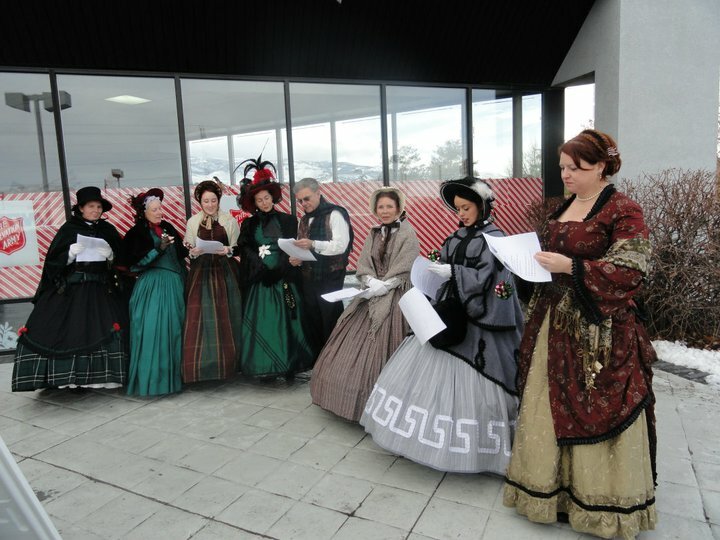 Caroling out in the cold. And a cup of good cheer." Just a normal day, hanging out in the mall. It was a wonderful time of visiting and laughter, and making a scene. A great big thanks again to Warren and Elizabeth for the treat. It was wonderful that our time together did not have to end after the singing stopped.